If you are planning for, or in the midst of, a building project, you have probably been doing an immense amount of research to ensure that your new space will serve the needs of your community, draw people in and stand the test of time for years to come. Through your research journey, one event that you might want to consider, if you haven’t already, is the Library Journal Design Institute. Demco has been involved with these events since 2006 and they always prove to be very insightful days that focus on everything from the broader trends right down to some of the details that you have never considered or specifics that you have a high level of interest in. Library Journal’s Design Institute underway in the newly renovated Boston Central Library. The Library Journal Design Institute has become one of my favorite events and the value of this event is in the focused nature of the group and the networking and collaboration opportunities that it provides. With around 100 library attendees, 5-6 architects, 6-8 vendor partners and the Library Journal staff there is immense knowledge and insight represented. Just about any question can be answered from multiple informed perspectives and provide options for how challenges can be addressed. Over time I have found that these events have evolved to stay current with the changing needs of the library and there is always something new and interesting to learn. I just returned from the most recent event in Boston where we had the opportunity to be the first inhabitants of the 2nd floor of the Johnson Building of the Boston Central Library. The bright, cheery space set the stage for the discussion of the day. Create a civic presence — The library should be positioned as an integral part of the locale and to do this, it should have some type of civic presence that fits with the rest of the community. In general, the library is the most important civic center as it is open to all and is the place that provides free access to materials and information and is the “school” for the entire community. Plan ahead — Setting program objectives for your building project is probably one of the most important things that you can do early on in your project. These objectives help to provide a unified direction and intent for the project and create perspective that keeps the big picture in mind when getting deeper into execution. Well defined objectives help to ensure a successful project. Think about your customers — Libraries need to become much more user focused in their approach. The model has flipped from one where “books stake out their territory and people squeeze into the remaining space” to a much more intentional approach to designing spaces that people are excited to inhabit and take into account how space is really used. Involve staff — It is very important to keep staff concerns in mind as you’re going through a redesign process. It needs to be clear that changes are not to design them out of a job but rather to free them up to do other things. If you can point to examples of work that might be more interesting and/or customer focused that replace tasks that can be automated it can be helpful. 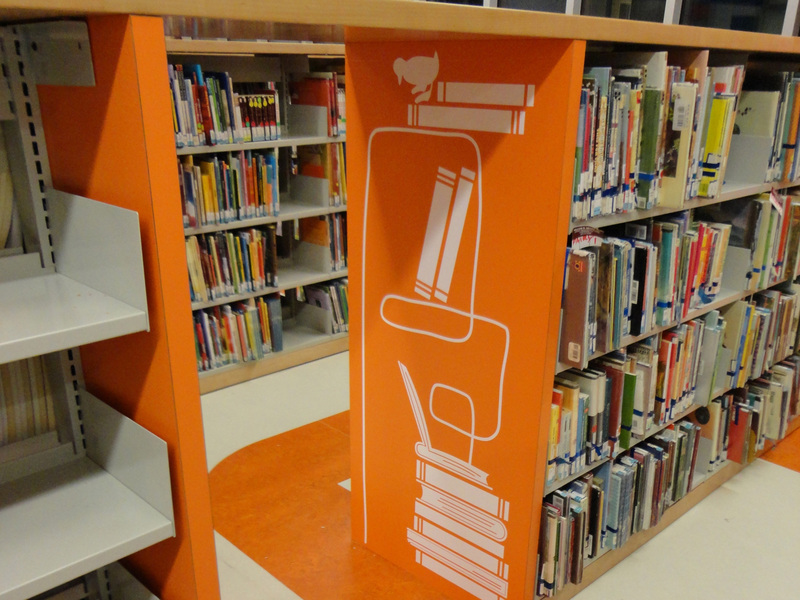 Keep context in mind — Creation spaces are being considered in many libraries and there needs to be careful evaluation as to what is important for each library by assessing the needs of their community. In addition, staffing and maintenance plans need to be considered. 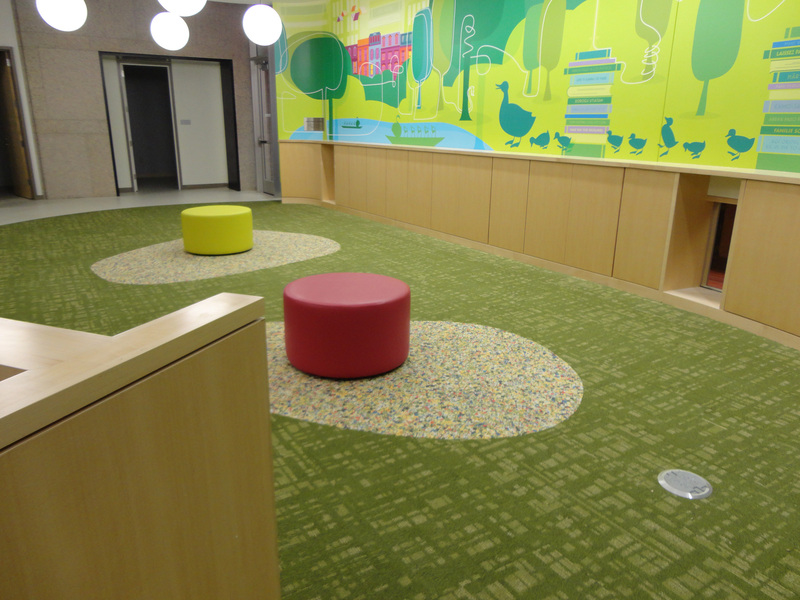 The enclosed Children’s library is bright and cheerful. The youngest visitors have their own exploration space. Discovery is an important part of the library experience and surprises are found within the stacks. 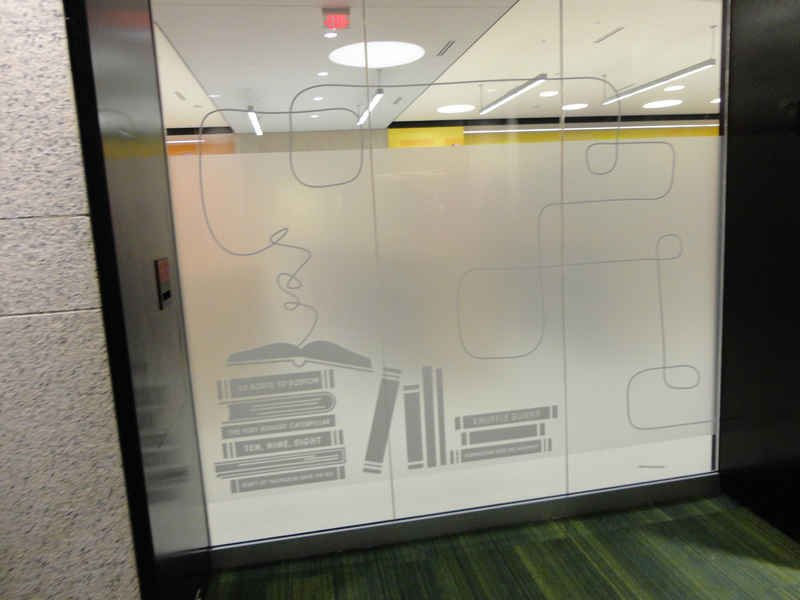 Frosted glass adds a little mystery to what’s inside while incorporated branding encourages exploration. As the library evolves, changes to functions and spaces are inevitable. The conversations of the day illustrated that there should be as much flexibility in design as possible and insightfully anticipating needed changes through actively listening to the community is critical. 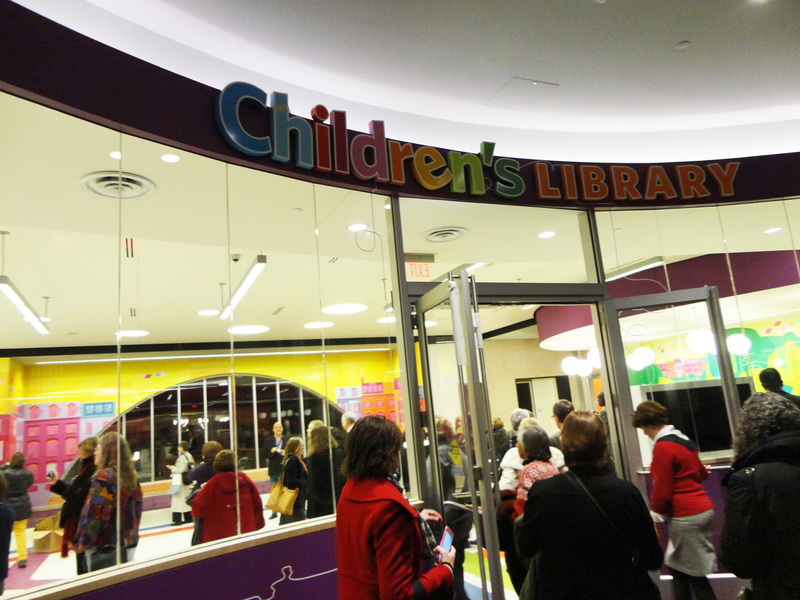 One of the architects articulated well that libraries should “provide a gateway for creative concentration and conversation” and if this can be accomplished, it embraces both the traditional and forward-looking desires for the library.